Millionaire households in the U.S. jumped by more than 700,000 last year, according to a new report from Spectrem Group. The U.S. now has a record of more than 11 million millionaire households, which is an increase of 6 percent over the previous year. The number of millionaires is now beyond the pre-Great Recession level of 9 million. Household net worth—the value of all assets such as stocks and real estate minus liabilities like mortgage and credit-card debt—rose more than $2 trillion last quarter to a record $98.746 trillion. In 2017, U.S. household net worth rose to almost seven times disposable personal income, which is above pre-Great Recession highs. By all accounts, the U.S. economy has gained some significant momentum since the 2016 election. The amount of Americans without any real savings continues to be at an extremely high level. Wage growth in the U.S. has been stagnant for over 30 years, and is not rising to levels it needs to for a healthy economy. Americans with low to no savings has become a significant issue that cannot be ignored. While most politicians and the media are fixated on the daily assessments of the economy and the latest figures on job growth or the stock market, a series of studies have been churned-out over the last several years (one of the recent studies was reported in CNN Money and conducted by Bankrate) about the how low rate which Americans save money threatens their ability to meet emergency expenses and retirement. According to experts and financial planners, Americans need to be saving between 15% and 20% of their annual income in order to cover unexpected expenses, and have enough for retirement. A combination of factors, including rising expenses, lack of wage growth, taxes, and poor government and private sector policies, as well as bad personal habits, are all contributing to this lack of savings. 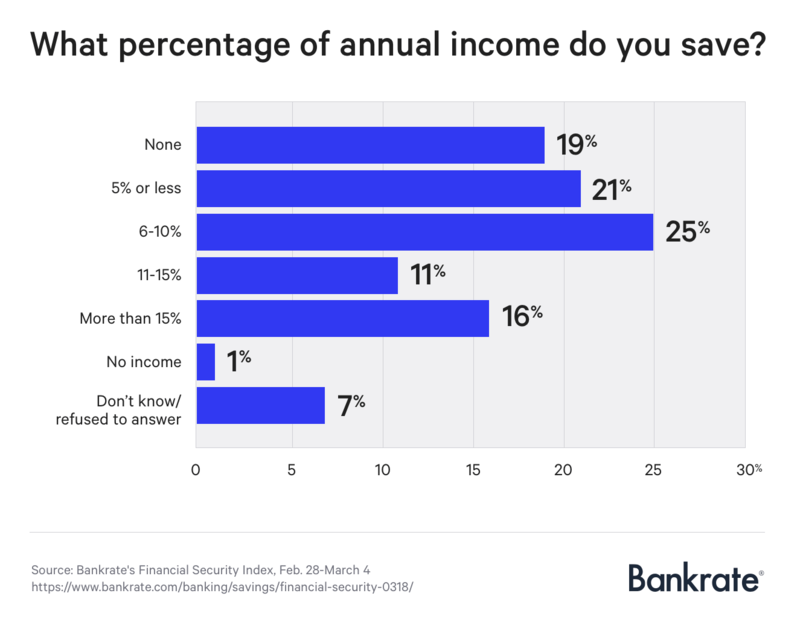 But, if you asked Americans what they think - they place most of the blame for a lack of savings on their rising expenses and lack of wage growth or a quality job that helps them to make ends meet. 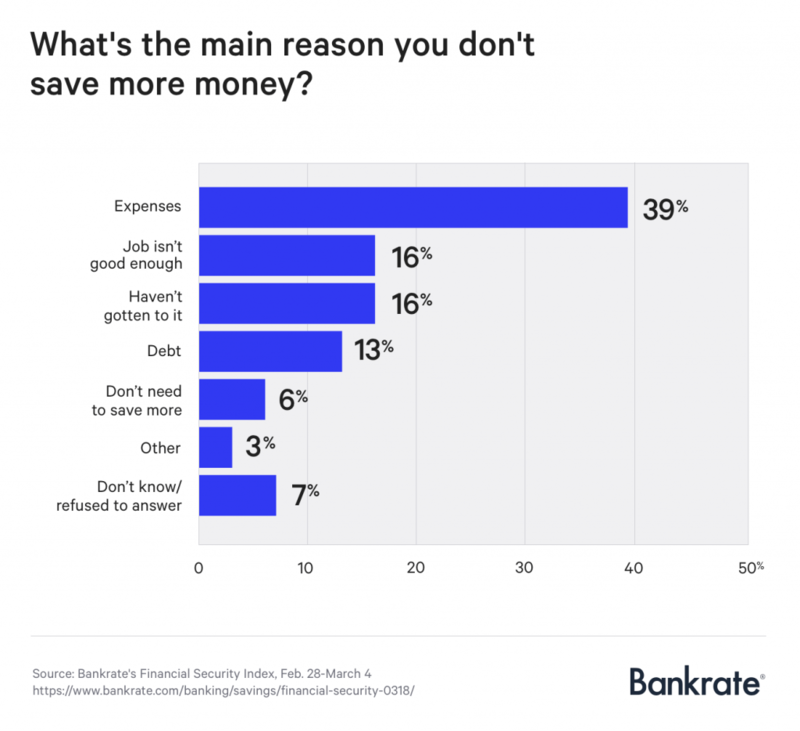 According to Bankrate's study, when asked for the main reason they were not saving more money, the two most significant roadblocks cited were expenses and the lack of a better paying job (Click to view Bankrate chart). This echos the results found in a separate study, where GoBankRates reported that 40% said they did not earn enough money to save, with almost 25% saying that they were struggling to pay bills - a sign that a higher percentage of Americans were living paycheck to paycheck (Click to view GoBankRates chart). Because while there is positive sentiment about the economy in the short-term, a lack of savings means that emergency spending as well as discretionary spending is more likely to be made with a credit card. Without enough money saved to fall back on, a majority of Americans are at serious risk of financial ruin if the economy takes a sudden downward turn as it did during the Great Recession of 2008. In fact, the Federal Reserve reported earlier this year that revolving credit, which consists mostly of credit cards, increased by $11.2 billion to $1.023 trillion. This amount is higher than the $1.021 trillion high reached in April 2008, which was immediately before the market collapsed and sent the economy into a free-fall. In one survey from the National Foundation for Credit Counseling (NFCC), 25% of Americans were not paying their bills on-time, while 8 percent had bills go into collection. Both are increases from the previous year. This data lies in stark contrast to the decline in delinquencies (people who were overdue on their loans by 30 days or more) across eight categories that the American Bankers Association tracks. The ABA also said it saw a similar decline in bank-issued credit cards. It could be that Americans are prioritizing their debt payments to ensure they keep their home, car, or other big ticket items, while at the same time, paying other expenses late. In either case, it is sobering news that shows while there are benefits from a more positive economic climate, there are larger and more complex problems across the economy as a whole that threaten to derail the economic well-being of millions of Americans. 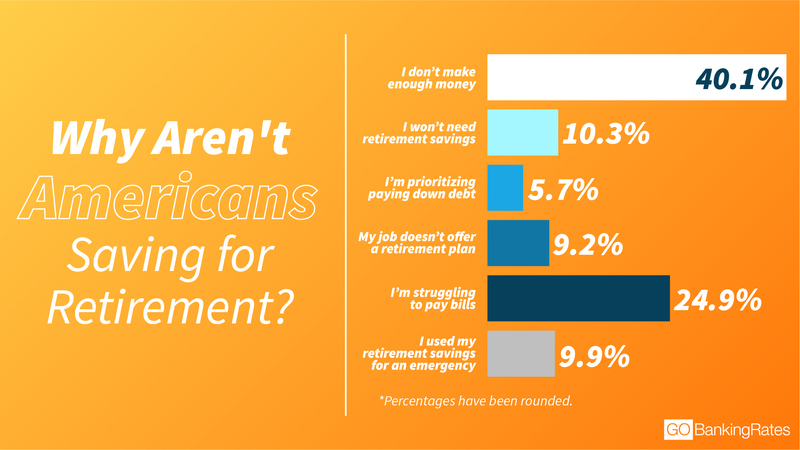 Another reason why a lack of personal savings is significant for Americans is because for every individual who lacks the money necessary for retirement expenses, including health care, the federal government will need to spend more. This is a problem because the federal government is already seeing short-falls in Medicare and Social Security fund collections, and there predictions of fund bankruptcies in the near future. For example, at its current pace, Medicare will be bankrupt by 2029 and Social Security will go bankrupt by 2034. In the case of Medicare, the revenue shortfall in 2016 alone was $349 billion. Instead of increasing taxes to cover the difference, the government has borrowed more money, and recently passed significant tax reductions, which will reduce future revenue and make the overall budget shortfalls greater. This also will impact Social Security, which is projected to owe more money that it will take in over the coming years. With healthcare costs continuing to rise, and payments on the debt set to increase as the Federal Reserve raises interest rates, the amount of money available to fund retirement for future generations will be almost non-existent. With such a large number of Americans lacking savings, the financial burden for younger generations could be back-breaking, and end up leaving tens of millions of Americans without the care they need. Americans have not always been bad at saving money. Lower savings is a trend that started about 30 years ago. Have Americans always been poor at saving money? And if not... When did Americans stop saving money? When did the trend start? When looking at this as an historical issue, the ability of Americans to save has changed sharply in our very recent history - namely - over the course of the last thirty (30) years. For example, the bottom 90 percent of households saved 10 percent of their income in the first Reagan administration (1981 - 1984). By 2006, their savings rate was nearly negative-10 percent. In fact, the Reagan years were the peak of wealth share for the bottom 90 percent of Americans, when they reached 35%. As the decade came to a close, a number of factors helped change the economic landscape to discourage savings - some political, some technological, and some habitual. For example, government policy shifted during the late 1980s and early 1990s on a number of fronts. Home-buying became easier, and as a result, mortgage debt skyrocketed. Home ownership and mortgage debt had seen relatively moderate growth through the early 1980s and 1990s. However, by the mid-90s, mortgage debt was rapidly accelerating. While it took approximately 10 years for mortgage debt to double from the 1980s into the early 1990s, from 1995 to 2005, mortgage debt had tripled. Borrowing, credit, and government financed loans all became easier and easier to obtain for a wide variety of needs, from housing to health care to higher education. The end result is that spending and debt peaked right at the time the Great Recession began. It also is worth noting that since "wealth share" combines all assets of value net the debts, it is not hard to understand why wealth share, which had been at 35% for the bottom 90 percent by 1985, had all but vanished within a few years. By lower and middle-class Americans taking on greater property ownership, they - in many cases - became cash poor, and had liabilities that greatly exceeded their assets. When you look at the rise in wages that occurs during the mid-1990s, a period that some analysts say does not explain why savings continued to remain flat or declined among Americans, it becomes clear that wage growth simply was not large enough to account for the new debt that was being accumulated. To put it to numbers, household debt increased from the "equivalent of 75% of national income in the mid-1980s to 135% of national income in 2009." (See NBER Working Paper Series, Page 25) Since about 90 percent of non-mortgage debt belonged to the bottom 90 percent of Americans, the added housing debt had, in effect, lowered the wealth share of millions of Americans to 1940s levels. Hence, government policy-making at the time wanted to make home ownership easier, make college easier to attain for more students, and expand consumerism to grow the economic fortunes of larger corporations. The policies all worked. Home-ownership expanded significantly. Public and private college enrollment increased by over 45% (5.5 million students) in just 20 years (from 1985 to 2005). Larger corporations were able to grow larger. And consumer spending increased dramatically. A period of booming economic activity that many still celebrate today as a "gold standard" took place. Only, these policies had a very unforeseen after-shock, which was the destruction of savings and the subsequent Great Recession, which wiped out the economic gains of millions of Americans. A "Third Wave" society that exists in conflict with itself. As significant as these policy shifts are, they only tell part of the story. A couple more key changes took place. First, government policy changes that were designed to fuel consumerism to benefit large corporations created an envy complex that impacted a majority of lower and middle income Americans. Statistics have shown that consumerism has significantly impacted poorer Americans, especially minorities. In short, with new wealth, and cheap goods imported from Mexico and China, more Americans could afford more items, including clothing, electronics, and other things that once had been limited to more wealthy Americans. It did not take long before new baselines of "necessity" were created in order to reduce or eliminate the perception that one was poor or of limited means. This also had the adverse affect of contributing to the decline in savings - or the habit Americans had in previous generations of being frugal and conscious of the need to save. Second, there were technology-driven societal changes that moved the U.S. economy from a "second wave" or industrial era economy into a pseudo- "third wave" or technological economy. The changes that took place included movement away from accepting standardized goods and services, and growing preference for more personalization. This wave of interest in personalization continues to force change to everything in our lives. It follows the belief that people want things tailored for their needs. And as computers became more effective during this time (Erik Brynjolfsson and Andrew McAfee cite an analysis in, “Race Against the Machine,” that between 1988 and 2003 the effectiveness of computers increased 43 million-fold), so to did the drive grow for personalized products and services in our daily lives. However, the only place people were getting more personalized service from was larger corporations who had the capital to invest in new computer systems, create algorithms and software for harnessing data, and then use mass distribution systems from an earlier era as well as modern technology (eg, the Internet) to deliver products and services in ways that small to mid-sized companies could not. Hence, a great paradox began to emerge about the kind of Third Wave society the United States was turning into. Third Wave societies thrive when their institutions are smaller and more agile, and not massive and centralized. So, at a time when the U.S. should be turning away from a strong, centralized, federal government, and large, centralized corporations, to more local governments and small and mid-sized businesses, the opposite has taken place. The federal government has grown larger and more powerful. As have a small number of large corporations. The other benefit of a Third Wave society is that people should have more control over decisions impacting their lives. However, when it comes to politics or how personal information is handled, the base of power is instead a select group of politicians and executives for large corporations. Government advocacy for large corporations has reduced new business growth. While other institutions are undergoing dramatic changes, and being adapted to align to a Third Wave society, government and big business has done an excellent job of eliminating its competition. We often hear about the U.S. being a land of opportunity, and a place where one's entrepreneurial spirit can thrive. 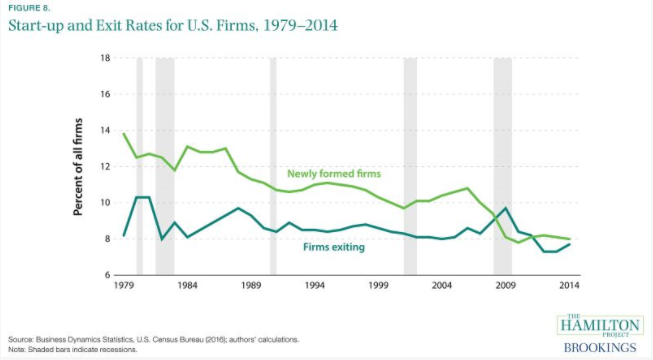 And while that is still true to an extent, over the last 30 years the U.S. has actually regressed in the number of new businesses it creates. In fact, the percent of all businesses that are new has declined from the 12% to 14% range that was enjoyed in the late 1970s and early 1980s, to just about 8% today. The number of new businesses being created is barely off-setting the number of companies that exit or cease to exist. Some of the reason behind this centers on federal, state and local government policy support for larger corporations, which look for tax and regulatory benefits to gain strategic advantages over small to mid-sized businesses. In support of large job gains for a community, government's routinely offer tax or regulatory incentives, and/or strike deals on infrastructure costs in exchange for other perks. People also have to remember, the over 90% of all legislation is influenced by lobbyists. Large corporations employ over 35,000 lobbyists, and run thousands of political action committees in an effort to influence legislation in their favor. The truth of the matter is - they do not lobby Congress to pass laws that benefit smaller or mid-sized competitors. A study from Good Jobs First, provided detailed analysis on more than 4,200 government contract awards dating back to 2007 that targeted 14 states. The awards were designed to stimulate economic activity and business growth. The study found that 70 percent of the awards – and 90 percent of their monetary value – went straight to large businesses. Another advantage lies in the special service arrangements big corporations receive. The Postal Service, which is another large organization with a monopoly on all letter mail, plays favorites by providing larger corporations, like Amazon, discounted shipping which provides a strategic advantage. The Post Office also provides discounts to Chinese businesses that export to the U.S., which can make the delivery of international cargo sent from China to America less expensive for Chinese businesses than for U.S. companies to ship domestically. Lastly, the decline in financial options for small to mid-sized businesses has prevented growth. According to American Banker, the number of community banks with assets under $100 million dropped from 13,000 in 1985 to 2,625 in 2010. The number of small, local banks that used to support small businesses is now under 1,800. Much of this is due to the tighter financial regulations that have been introduced for new banks and smaller banks. Meanwhile, larger banks were considered "too big to fail" and received significant taxpayer support following the Great Recession to ensure they would continue to lend to businesses - a result that largely did not materialize. With fewer banking options available, and large banks less likely to lend to higher-risk businesses, funding for business operations can be elusive for most entrepreneurs, or even for existing businesses trying to compete. In fact, studies have shown that once a larger corporation or chain store enters a market, new and existing competitors have less ability to get funding to compete. What's more, when larger corporations or chains enter a market, the amount of new businesses that get created drops. The lack of new business growth in the U.S. is significant when listening the story of the American economy, because increased competition across all scales of business not only impacts prices and costs, it also has an impact on employment, wages, and other businesses. Some have begun to suggest that for the U.S. economy to truly be considered growing, we need to recognize that we do not have a jobs problem, but we have a lack of new businesses. As new business creation has fallen, wage growth for Americans also has been falling. Of course, Americans are not wrong about their assessment on wages, job quality, or purchasing power not meeting their needs. The proof is in the numbers. Overall wage growth has been on the decline since the 1970s, and undergone a continuous decline over the last 30 years. The Great Recession caused significant damage to wage growth, which the economy is attempting to recover from - but won't be able to achieve before the next recessionary cycle, as the data shows below. As we can see from the Federal Reserve's chart (see above), each recession since the 1990s has resulted in knocking back wage growth to a new, lower baseline. Given the growing disparities in wealth, income and debt, current government policy from the Democrats and Republicans simply is not going to fix the problem. 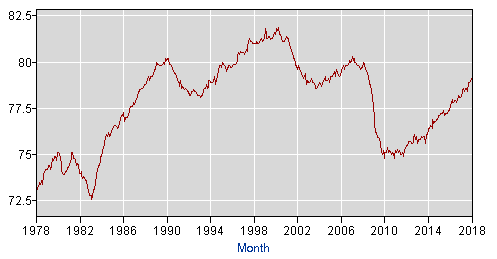 What about growth in labor force participation? For politicians, the disparity in wealth and wages is more of a political weapon used to rile-up the masses than it is recognition of a real problem to be solved. The truth is, members of both political parties see wage growth and the growing labor participation rate as a sign that the economy is not just doing well, but has actually returned to full employment. 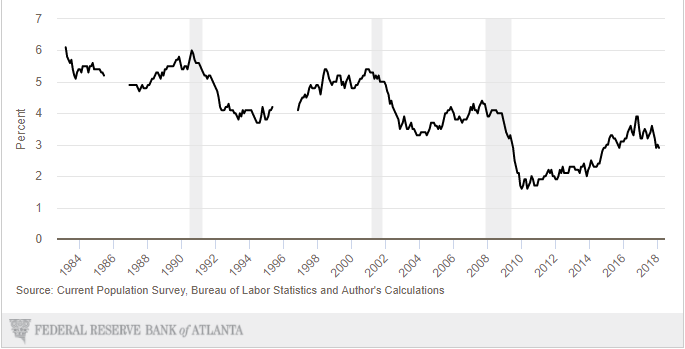 Certainly, on the plus side, data from the Bureau of Labor and Statistics shows that the country is recovering from some of the lowest labor participation rates in decades - going back to the Carter administration. Low labor participation was one of the weights (there were many others) that prevented the economy during the Obama administration from ever really feeling like it was growing in a healthy and confident way. Though the rate is still below where it was in 2007 and 2008, when a sharp decline in labor participation began, there has been a steady upward trajectory. It is this upward movement that has politicians from both sides of the aisle trying to take credit for good economic news. However, is the news really that good? After all, if the trend has been going up - why are Americans saying that expenses are too high and salaries from work are not cutting it? For starters, though the economy has begun to recover, it has a lot of ground to catch up in terms of income. The share of total income received by workers - as opposed to that received by business owners - declined significantly since the turn of the century. In fact, apart from a spike in the late 1990s to 2000, the percentage share of total income received by workers has been on a steady decline throughout the early 90s - and accelerated its decline over the course of 21st century. This is typically the kind data that Democrats pounce on, and launch into more socialist and Marxist solutions to resolve income inequality. However, there is more to this data than meets the eye. We all recognize that the environment for wage growth depends on worker productivity rising, and a reduction in the cost for production taking place, which sets the stage for a worker to receive a consistent share of the gains they help to produce. What changed, starting in the 1980s and expanding into the 1990s, was a combination of events that ended up freezing wages for millions of lower-wage workers, and some higher-wage workers in specialized fields, and freezing-out millions of other Americans from working. First, poor trade agreements began to flood American markets with low-cost goods. This has been a boon for large corporations, like Wal-Mart and Amazon, but not for American manufacturing and small to mid-sized businesses. The decision by government policy-makers to emphasis consumer spending over a balanced economy has tipped the scales too far to large corporations, and created a dependency on imported goods (See US Trade Deficit historical chart. Note: At the time of this article, the U.S. trade deficit hit a 9 1/2 year high. ), and changed our culture so now we assign less value to repairing items or saving for important purchases, and instead opt for throwing away and replacing immediately with something new. Second, though employment in manufacturing has been on the decline for many years, it dropped 31% from 2000 to about 2016. Manufacturing's share of nominal GDP should be closer to 20%, but today it is closer to 10%. The decline in employment in higher paying manufacturing jobs, especially the rapid decline at the turn of the century, pushed more American men out of the labor force. Third, immigration - both legal and illegal - has depressed wages for millions of Americans. This has happened a few different ways. For example, despite the U.S. graduating more STEM-related professionals and students with high-tech expertise than there are jobs, large corporations still import foreign labor and skirt U.S. laws to hire foreigners, because it is cheaper to do so. The end result is that wage growth in some high-tech fields gets slowed, and Americans with high-tech degrees need to seek employment in other fields. Another example is that much of the new job growth that has occurred since the Great Recession has not gone to native born Americans, but to immigrants. According to the Bureau of Labor and Statistics, from 2007 to 2014, the share of employment growth for immigrants was nearly 100%. Though native-born Americans accounted for 69 percent of population growth during this time, and immigrants 31 percent, the new job gains went almost exclusively to foreign-born workers. This accounts, in part, for why wage growth and wealth share, have been relatively low during this time period. Fourth, the growth in the number of Americans who have gone on welfare or disability, and either do not work or have lower income jobs, is staggering. From 1990 to 1996, the number of people on welfare and in need of healthcare assistance grew by 62%. From 1997 to 2007, that number had increased further - growing by 50%. By 2014, the number of Americans on welfare hit a historical high, and the number continued to grow. Why this skews labor participation and income data is because when millions of Americans were displaced from work - they eventually sought government assistance and have not returned to work, mostly because the jobs they once had are not available. In examining the welfare system, it has become apparent that the programs are being run ineffectively with money spent to welfare recipients distributed or applied inefficiently. For example, if converted into an hourly wage, welfare disbursements would actually create jobs above the poverty level for millions of Americans. Some estimates have put the hourly pay at over $30 per hour for a 40-hour work week. An hourly rate of $30.00 equates to a weekly pay of $1,200, monthly pay of $5,200, and an annual salary of $62,400. And fifth, larger corporations, organizations, and government, not small businesses, have become the biggest employers in most communities. Over time, these companies have used their clout to keep wages lower. With less mobility, more and more American workers feel hesitant to ask for increases in their salary. Lower-skilled workers, fearful of being replaced and dependent on income to make ends meet, are even less likely to ask for increases in pay. All of these factors, and others, have contributed to pushing workers out of the labor force, displacing some workers from the labor force, and placed pressure on less-skilled worker wages and some high-skilled worker wages. One last point to keep in mind deals with what experts call the "text book" approach to dealing with wage growth, personal wealth, employment and other economic issues. There is a good chance that most policy-makers and economists need to throw away their old text books, and recognize that there is more to the low savings rate and lack of wage growth than traditional models can explain. What kind of policies and changes do we need to increase wage growth and encourage savings? In the end, wage stagnation or a lack in wage growth has been one of the most significant forces preventing Americans from saving more money. But as this article identifies, there are real forces contributing to this trend. In order to grow wages, and increase savings, a number of steps have to be implemented, and many run counter to what the Democrats and Republican propose. The decline in new business directly impacts the lack of wage growth we have seen in this country. Reductions in new business creation have been the result of policies designed and implemented by members of both political parties to increase the advantages of large corporations. As Ross Perot used to say, "We have the best government that money can buy." And with armies of lobbyists, large corporations have been able to squeeze out competition from small and mid-sized businesses, and prevent a large number of new companies from ever entering the marketplace to compete. Therefore, one of the first steps to actually realizing new policies to improve wage growth, wealth generation, and savings for lower and middle-income American families is to end the two-party monopoly of power. Regardless of the difficulty, the issue at stake is pretty simple: If we want policies that encourage growth in new businesses, we need to enact significant lobbying reform and policies that support competition to large corporations, which the Democrats and Republicans have been unwilling to do. After many years of self-protecting election laws, regulatory formats, and gerrymandering districts to protect their own political interests, the Democrats and Republicans have become a legal monopoly on political power. While a commercial monopoly can mean horrible prices and poor customer service, our political monopoly means that our government has effectively stopped working for the people, and works only for a narrow group of special interests. As a result, we often get horrible candidates, negative campaigns, and policy-making that is akin to "kicking the can down the road." Just imagine if every time when you had to choose between a supermarket, a cell phone, a restaurant, or any other product or service, you said, "I don't like either of them. I guess I'll choose this one, because it is not as bad as the other." Not exactly a way to live, right? And yet, most Americans say that every time they go to vote. So, one of the steps needed to change the economic conditions in this country is to end support for the two-party system. That may mean you need to take a chance and run for office. Or support an independent candidate. Whatever the action, political change needs to take place to improve our economic position. One of the troubling pieces of data that has emerged from recent stories about new wealth being created is that it is largely in the stock market. While there is nothing wrong with stock market growth or generating wealth from it, the numbers are often manipulated by Democratic and Republicans politicians as evidence of a robust economy. In truth, most Americans generate wealth from job-related income. Wages are increasing, as shown above, however they are not growing fast enough, and across a wide-enough spectrum of citizens, to start to make-up for bad policies of the past. There simply is not enough new wealth to cover expenses and allocate for saving. And what wealth is being created in the stock market, as noted above, is for a small percentage of Americans, and subject to the highly volatile swings of the market, which can lose trillions of dollars in value over a couple of weeks just as easily as it can earn trillions of dollars in value. We need other ways for lower and middle income Americans to generate wealth, while simultaneously reduce expenses and encourage savings. One approach is to look at how traditional benefits, like healthcare, can be converted into wealth generators. Lower and middle-income Americans would all get HSAs to use for all medical and healthcare related expenses. A small percent would be set side for high-growth in the stock market. Another small amount would be set aside for conservative investment and savings. A third amount would be direct individual contributions (which could be placed into high-growth or conservative investments, or into the general fund, or dispersed between all three). A fifth source being from third-parties that would be allowed to use those contributions as a deduction from their current taxes up to a specific dollar amount - much like donating to a non-profit. Account holders would have a federally guaranteed minimum savings amount, to avoid having their fund reach a zero balance. HSA owners would have restrictions on what the money could be spent on - eg - limited to healthcare and medical costs. The goal with this type of program is to create a wealth generator for lower and middle-income Americans, and provide an incentive to wealthier Americans to donate money either into pools of HSA owners or directly to HSA account owners who qualify. This also bypasses inefficient federal government management and fund dispersal, as well as the danger of Congress which may want to spend money ear-marked for this program on something else. Another benefit of this type of program is that it could be managed by local governments and / or private businesses with limited federal oversight, and immediately begin to generate additional income that covers one of the largest expenses facing Americans today: healthcare. In conclusion, this one idea allows American workers to gain back lost ground in wealth, re-start greater personal ownership of their healthcare and healthcare expenses, and encourage savings by providing significant short-term and long-term benefits to saving healthcare dollars. Another approach is to use the concept of a "basic income" that is being experimented with other countries, and adapt it to a new business investment program that increases the number of competitive corporations in America. No business or personal income taxes will be collected for entrepreneurs for the first 3 years of their business operations, or anyone they employ - up to 15 people. This number doubles to 6 years and 30 people for new manufacturers who qualify. Instead of a "basic income" that can be spent however a person wants, a new business investment income would be used to allow new businesses to invest in technology such as software, equipment, facilities, postage, and more. A business will have to provide receipts / records for all purchases and have those verified, but the benefit is that the government starts to invest in innovation and new business growth. One of the challenges associated with the new tax law, and why it was largely unpopular with small businesses when it was announced, is its elimination of deductions that sole proprietors and other small business owners relied on to reduce their burden. The problem is that the eliminated deductions are permanent, whereas the tax cuts are not. In fact, Democrats were quick to call for repealing the tax cuts (but, you will notice, not restoration of the deductions). This program, however, would shield new businesses from any changes to the tax code by simply removing them and their employees from it. The time given to these new companies would allow them to grow and become financially well-enough established that they can compete in the market against more entrenched companies. People often talk about "education reform," but what is really needed is an education revolution. In a technological society, learning becomes a life-long activity that is fueled by one's desire, not at the compulsion of one's government. The current system of education that we have in the U.S. is outdated, and ill-equipped to handle the knowledge and skill development Americans need to contribute to society, and generate higher levels of wealth. For starters, it is based on the 19th and early 20th century industrial factory. Over one hundred years of evolution, and our school system is still preoccupied with the total number of days that are spent in classrooms, and measuring performance on standardized tests that require memorization and not the application of knowledge learned. Second, even our policy-makers think of education in the old factory model, and children like pieces of equipment that can changed during the assembly process. Instead of fostering individuality and creativity, and allow students to pursue their interests, everyone is expect to go in and come out with the same knowledge. Education reformers believe boys and girls can be socially engineered. And movements have been underway to eliminate art and music programs, so that schools can concentrate more on STEM-related courses. What people want to learn is irrelevant, because the policy-makers have decided what is important. This is not how a Third Wave society functions. When people - mostly politicians - talk about "education reform," they usually talk about making cosmetic tweaks to a system that is not designed for a technological society. The problem is that as an ecosystem, our modern public schools are so well-balanced between a group of powerful forces, it is almost impossible to make the most simple changes to class schedules, let alone redesign a curriculum or learning path in the ways that are necessary. This is why I say we need an "education revolution." A "revolution" signifies a "fundamental change" has taken place, and a new system has been adopted. For starters, a public education system. But a public education system that runs in parallel to the current model, and functions in completely different way. The future of education rests in the ability of students who want to specialize in specific areas to do so. Personalized learning, or the idea that one can learn what they want, when they want, and where they want, is already transforming homeschooling, online education providers, and bringing about huge growth in supplemental education providers and tutors. Mentoring and apprenticeship programs also are on the rise. As is the notion that getting out of the classroom to interact with people of different age groups creates children who mature faster, become more responsible adults, and learn better socialization skills. Would such a system require a large investment? Absolutely! But one thing we know from years of data is that expanding education opportunities, and enhancing creativity and knowledge, are the best ways to: reducing crime, new business development, and eliminating income / wage / wealth inequality. Lastly, one of the other key steps we need to take is implement more policies that encourage savings, as well as those that elevate financial pressure on those in the most need. What was interesting about the Great Recession is that politicians made a strategic investment in American banks - especially larger banks - under the idea that they were too big and important to fail. A sad message to send to American consumers facing bankruptcies and foreclosure, but never the less, that was their decision. The belief among members of Congress and within the Bush administration at the time was that once the banks received a taxpayer funded loan, they would keep lending to American businesses - especially small and mid-sized businesses, so they could continue their operations, meet payrolls, etc. The need to rescue the American consumer, who in total accounts for 70% of all economic activity or more, was pushed aside - and the banks became the number one target for aid. We all know now that despite the cash, banks, including those that did not face any serious threats to their business operations, did not lend to small and mid-sized businesses - and instead sat on the taxpayer money. They later returned it as part of the agreement. Now is the chance for our political establishment to try and fix past failures by actually putting the consumers ahead of big corporations and big banks, and enact policies that will help encourage more personal savings, as well as alleviate financial pressure that has only been exacerbated by the Great Recession. One possible recommendation is that the government can help alleviate student loan debt for older Americans who are still in their prime working years. However, instead of a taxpayer funded bailout, the government could create a national lottery to help fund student loan forgiveness. Another recommendation is to make changes to the 401K retirement system, and mandate that any account created needs to maintain a certain balance. Lastly, using financial matching incentives (with conditions) for lower and middle-income Americans who maintain a growing savings account. At the end of the day, the threat to our economy from Americans lacking savings, and lacking adequate wage growth, is too serious to avoid discussion on every possible idea. Complete the form below, and once a week you will receive a report detailing the top stories of the week, as well as the latest articles, videos, podcasts, and other materials from Michael Hackmer.